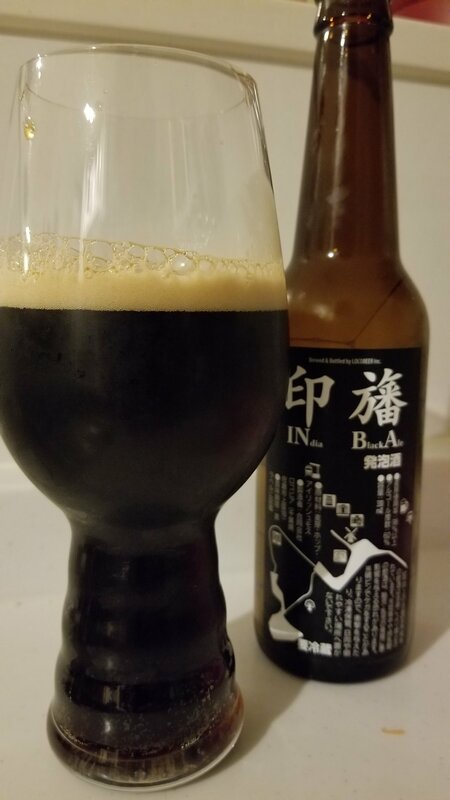 Locobeer InBA is a 6% India Black Ale, aka a black IPA, from Locobeer, based in Sakura city, in Chiba, Japan. It’s part of their seasonal lineup and can be found on sale in the autumn time, though the actual date varies. The name INBA comes from the kanji 印旛 , which is the area of Chiba that Locobeer is situated in, and also the original name for Sakura city. Moreover, each year uses a different hop with this 2018 edition using Ibuki hops. Locobeer InBA poured out a pitch black colour with a slight off-white tan head to it that clung to the side of the glass. Being a black IPA, it had a distinct roasted black malt aroma along with a hint of chocolate to it – strange for an IPA but then the citrus notes come through once Locobeer InBA has warmed up a bit, so let it do that before drinking. It was a peculiar mixing of aromas to be honest, but it worked when it had warmed up. The initial acrid bitterness fades to your typical IPA bitterness from hops. The bitterness was more restrained than your usual IPA, perhaps due to the aforementioned black malts toning done the flavour a tad. The body was a bit thin though which meant the flavours tended to be on the softer side for an IPA, so those who dislike potent hoppy IPAs may enjoy the Locobeer InBA. The lingering grassy notes left a peculiar aftertaste but they did fade fast. Locobeer InBA is a strange beast of a beer – I liked it but I’m not sure if I would drink it again.